According to this fortnight’s Private Eye, 15th-28th June 2018 Tony Blair and other wealthy donors have returned to fund Progress, the Thatcherite entryist group in the Labour party. The article states that ‘since its foundation, Progress has promoted Blairite candidates and motions inside the party’. The article goes on to state that it has, however, lost most of its internal battles since Jeremy Corbyn came to power, and that Lord Sainsbury’s announcement that he was no longer donating to it was a major blow. It’s now looking for new funders. The article cites the Electoral Commission to reveal that the liar and unindicted war criminal gave it £10,000 on 26th March. The article states that this is the first time Blair has given it anything from the vast wealth he’s made from his various consultancies since leaving office. Other donors include the City headhunter, Jeremy Breaks, who gave Progress £8,000 in April. He’s never given to the Labour party, but did give £2,000 to Owen Smith’s campaign for the Labour leadership. Another financier, private equity investor Stephen Peel gave them £10,000 in January. He also hasn’t donated anything to the Labour party, but tellingly he did give the Tories £50,000 in 2008. He also funds and sits on the board of a business-orientated Remain group, Best For Britain. Martin Clarke, the chief financial officer of the AA, also gave Progress £10,000 in February. He’s a long-standing Labour supporter, but his only recorded donation to the party was £2,960 to the Morley and Outwood Constituency Party in 2014. He also gave money to one of Corbyn’s rivals. In 2015 he gage £37,500 to Yvette Cooper’s campaign to gain the Labour leadership. (Page 12). Blair and the other donors to Progress are thus the same City types, for whom Blair decided to sacrifice the manufacturing sector, and betray the party’s working class roots and supporters, privatising industry, including the NHS, cutting welfare and state aid, all to ingratiate himself with big business, Murdoch and the right-wing press, and swing voters, who would otherwise vote Tory. It also shows just a touch a desperation on the part of Progress and Blair himself. Progress were never more than a tiny faction in the Labour party, which succeeded because they held the levers of power. Now their power’s waning, they’re desperate to get more money. And if Blair’s donating to them for the first time ever, it shows that he’s worried that his political legacy is also in jeopardy. 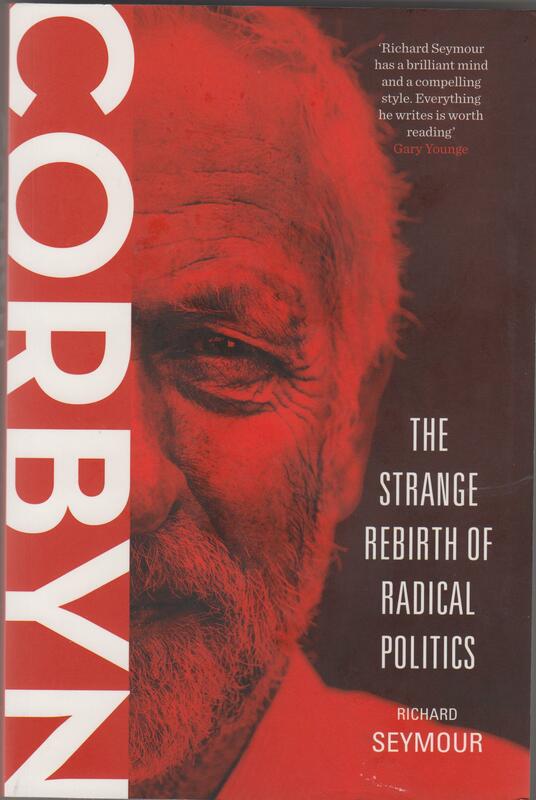 A few days ago I put up a piece about Richard Seymour’s book Corbyn: The Strange Rebirth of Radical Politics (London: Verso 2016). Seymour’s analysis of the rise of Jeremy Corbyn, and what it means for the Labour party, is very much his own. Seymour points out that one of the reasons why Corbyn was able to take the Labour leadership was because the right-wing Labour vote was divided between three opposing candidates. He sees the Labour party as never having really been a Socialist party, and that Corbyn’s election as leader was part of a process of political stagnation and degeneration both within the Labour party and generally in British politics. One of the main methods of obloquy from the centre-left papers – aside from the claim that Corbyn’s supporters were either spaniel-eyed naifs, gently prancing around in cloud cuckoo land, or dangerous ideological zealots – was to bait Corbyn’s supporters as sexist. The Guardian had backed Yvette Cooper for the leadership, partially on the grounds that she would be the first female leader, bringing ‘down-to-earth feminism’ to the role, and challenging austerity policies that hurt women. Its leading columnist and former Social Democratic Party (SDP) star Polly Toynbee seconded the endorsement, announcing: ‘Labour needs a woman leader.’ This prompted a reply by the seasoned feminists Selma James and Nina Lopez, who pointed out that Cooper not only supported ‘sexist austerity’ but had also implemented it in government, abolishing income support and extending work-capability assessments for the sick and disabled. Nonetheless, having supported Cooper as a ‘feminist’, it didn’t require much imagination to notice that Corbyn was not female and thus to indict his supporters ‘brocialists’. Suzanne Moore complained that as Corbyn was ‘anointed leader’ – that is to say, elected leader – ‘not one female voice was heard’. The remarkable thing about this complaint was that Corbyn won among women by a landslide. The polls showed that 61 per cent of women eligible to vote in the election supported Corbyn, while the two female candidates, Liz Kendall and Yvette Cooper, gained 4 per cent and 19 per cent respectively. The polling company YouGov pointed out that ‘women who are eligible to vote are dramatically more likely to vote Corbyn than men’. What Moore meant was the she hadn’t listened to the women who supported Corbyn, an important distinction. This campaign spread to the Independent,which published a surreal piece headlined, ‘If it’s truly progressive, Labour will have voted in a female leader – regardless of her policies’. It was also mirrored by the Telegraph, which gleefully wondered if Corbyn had a ‘women problem’. Cathy Newman, a Channel 4 News reporter who had recently made headlines by falsely reporting an example of sexist exclusion at a mosque, authored a piece for the Telegraph which sneered ‘Welcome to Jeremy Corbyn’s blokey Britain – where “brocialism” rules’. Newman’s complaint did not concern policy, on which Corbyn was difficult to attack, but representation. She alleged that none of the ‘top jobs’ went to women. Corbyn’s shadow cabinet, it must be said, was notable for being the first to have more than 50 per cent of its posts occupied by women – as opposed to the pathetic 22 per cent representation that women have in wider public life. The shadow ministries of Defence, Business, Health and Education were all run by women. The shadow cabinet was, in other words, more gender-egalitarian on this front than any previous Labour shadow cabinet. It is perfectly fair comment to lament that important posts such as shadow chancellor have never been held by a woman, but the force of the point is blunted if it is simply used in an opportunistic way to belabour Corbyn. Likewise, the New Statesman’s effort to pour cold water on Corbyn’s victory, with the headline ‘Labour chooses white man as leader’, would have been more convincing if the publication had not generously supported every previous white man elected as Labour leader. From this it’s very clear that the accusation of sexism and misogyny against Corbyn were merely another opportunistic smear by a group of entitled, wealthy Blairites. It was monumentally hypocritical, as these women were perfectly happy with promoting policies that actively harmed – and under the Tories, are still harming women. The ladies, who supported Corbyn knew better, and voted for substance, rather than the specious feminism of a female candidate, who was only interested in promoting herself and not improving conditions for women as a whole. Michelle, one of the many great commenters on this blog, sent me the link to this article by Novara Media’s Alex Nunns, ‘How the Guardian Changed Tack on Corbyn, Despite Its Readers’. This describes the way the Guardian initially supported Corbyn, but only when it thought that he was an outside candidate, who was unlikely to win the Labour leadership election. When Corbyn did indeed win, the Guardian’s furious reaction was to publish a series of articles attacking the Labour leader for being too left-wing. The Groaniad’s companion paper, the Observer, also reacted with the same outrage. And despite the Groan’s claim to be an impartial observer in the Labour leadership contest, it ran articles strongly backing the contenders Andy Burnham, Liz Kendall and Yvette Cooper. The piece also discusses some of the individual hacks at the Groan attacking and sniping at Corbyn. These are Polly Toynbee, Michael White, Andrew Rawnsley and Jonathan Jones. It points out that Rawnsley had a personal interest in making sure the Blairites stayed in power: he had written several books on them, and they had given him privileged access and information. By challenging them, Corbyn was threatening to cut of his access to people at the centre of power. One of the other columnists, Patrick Wintour, may have had an even more personal reason for attacking Corbyn. Many on the Left believe that ‘Wintour’ is the nom de plume of Peter Mandelson. As for Jones, his article was almost bug-eyed with hysteria. He described how he joined the Communist party when he was a student, but abandoned it when he saw the reality of life in the Soviet Union for himself, noting that the Soviet regime killed 6m under Stalin. Corbyn, he decided, represented this kind of totalitarian government. He then started trying to defend the free market by saying that ‘markets are human’. Well, so are many things. But they are also subject to manipulation, and do not necessarily bring wealth to the majority of the population. Thatcherite trickle-down economics don’t work in practice. As for Corbyn himself, this is the standard Red scare the Right has been running against Socialism and the Left since the days of the Zionviev Letter. They ran it again under Thatcher against Tony Benn, Ken Livingstone and about 30 other Left Labour MPs in the 1980s. I’ve seen absolutely no evidence that Corbyn is a Marxist, or that he wanted absolute nationalisation. But it just shows how far the Labour right has been infected with the Neoliberal virus. Jones is also guilty of a bit of holocaust minimalisation in his article as well. The Soviet Union under Stalin didn’t kill 6m Soviet citizens. It murdered about 30 million, at least 8m in Ukraine alone during the manufactured famine in the collectivisation of agriculture.